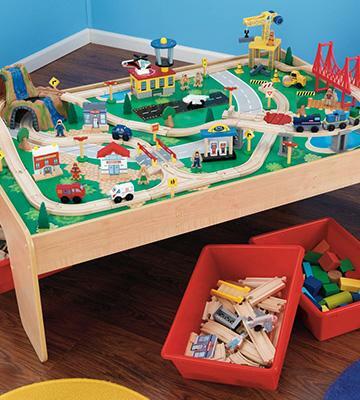 This kid-sized wooden train table will become a favorite playtime activity for your little one. It’s not just a railway, but a whole town full of adventures! Also, your child can expand an existing set by adding a variety of other toys. May not be suitable for small nurseries. KidKraft is an excellent choice for children over three years of age! It helps foster your kid's imagination and turn their fantasy into reality. And parents will appreciate removable storage bins to keep your child’s nursery clean and tidy. 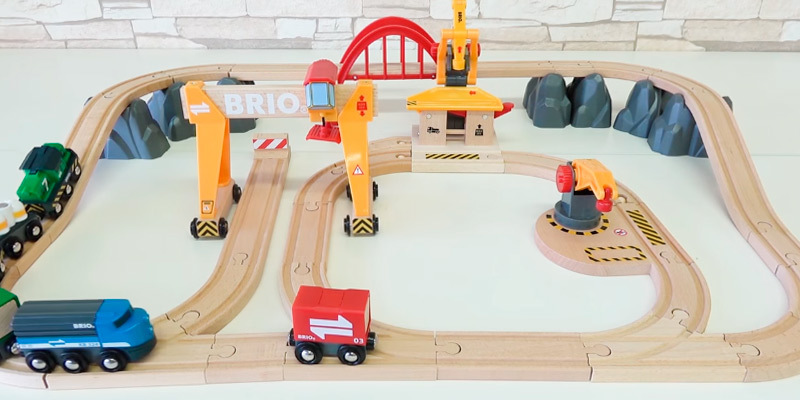 Brio wooden train set would fit confined rooms where there's not much space for big toys. All pieces can be stored away in a box until the next exciting trip. 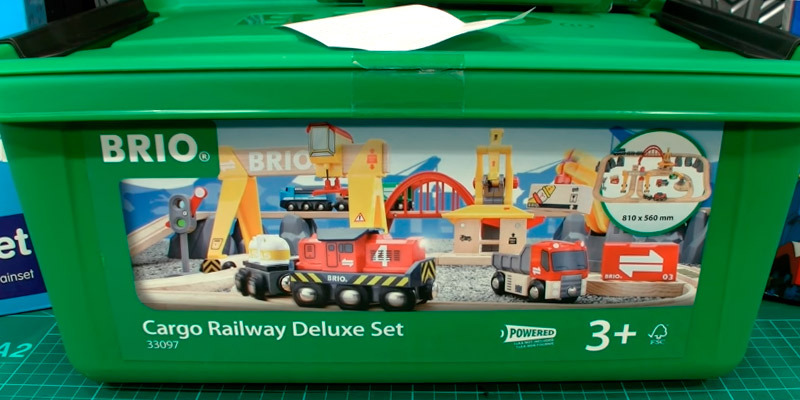 This admirable, bright train set will come to liking to kids over three years of age. The battery-operated set will make kids' play more realistic and diversified. Dozens of track pieces allow for building a variety of track formations, encouraging your child's imagination during play. The carriage wheels seem a bit wobbly. Melissa & Doug Deluxe railway set for 3-year olds and over offers a good quality product at an affordable price. The set is large so it will be an ideal solution for families with many kids. In addition to versatile track pieces for future expansion, the Orbrium Toys set offers non-colored pieces to boost your child’s imagination. The bridge can be a bit unsteady. Every child of about 3 years of age will be excited with such a variety of cars, buses and other pieces included in the set. 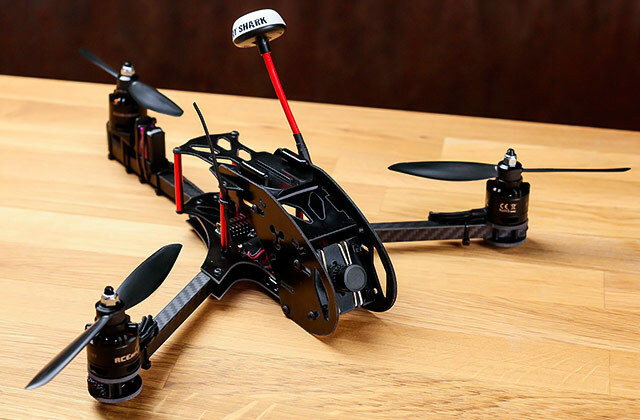 The set complies with the CPSC's testing and certification requirements. 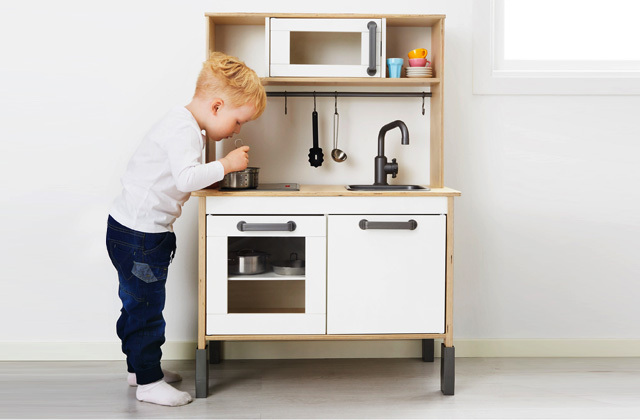 The Ikea Basic set is what you need to start your child’s large collection! Your kid will be encouraged to develop new practical skills while building up new track combinations. Larger trains from other sets may not pass through the tunnel. 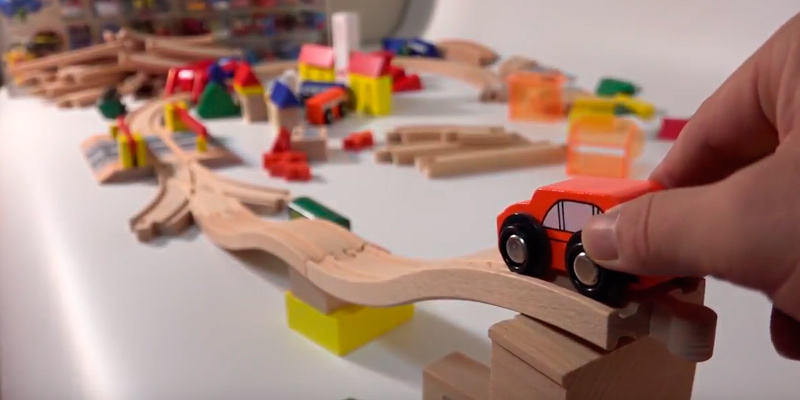 Ikea Basic train set can become an ideal solution for those looking for a simple yet exciting game to engage kids in an adventurous game and help develop their imagination. Every parent would love his/her kid to have a separate play area. Toys all around the house eventually can piss anyone off. This won’t be the case if you get this train set from KidKraft. It comes packed with a big wooden table where your kid would be able to store all pieces together away instead of scattering them on the floor. The height of the table isn’t too big and is suitable for kids of about 3 years of age. The manufacturer doesn’t recommend buying it for younger children since the set contains many tiny pieces that can be swallowed. For all the rest, it’s got everything you’d expect from a quality train set. The pieces from the set can be put together to build a real city, so you can give your child full freedom and see what he/she’d do about it. We’re more than sure your little one will be attracted to the game and spend hours at the table. The set is really fun and you’re likely to join your kids in play. The KidKraft train set is so colorful and diverse, you both will find playing with it a fascinating pastime. This multi-configuration train set is great for creating your own small town on an island-like table. The accessories include a police station, hospital, construction site, fire and gas stations, waterfall, various tunnels, bridges, railway crossings, and a helipad on a silk-screened landscaped play board made of solid wood. 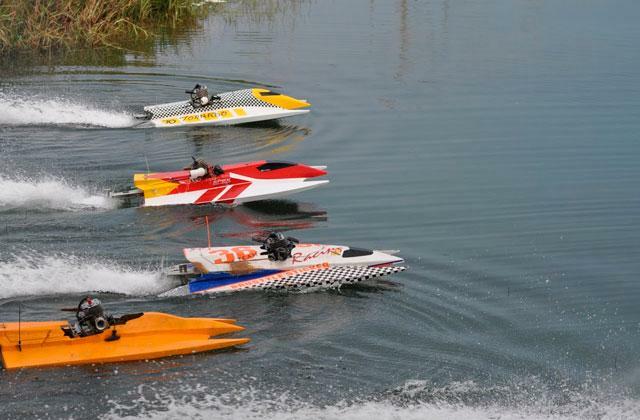 Moreover, the set includes 4 cars, a helicopter, an airplane, and even a boat! 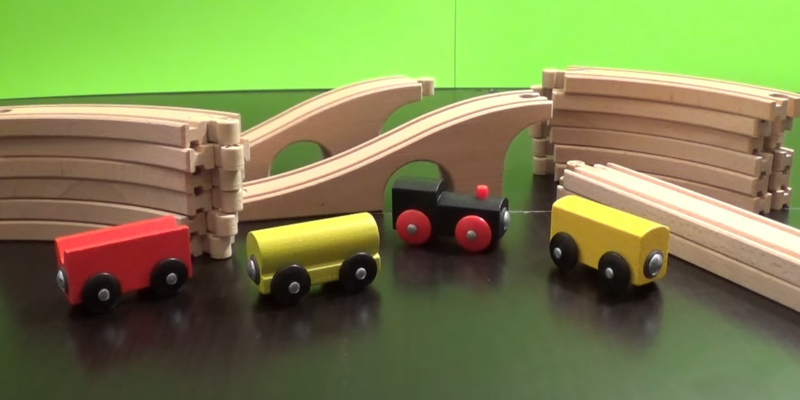 You can change the positions of wooden blocks with magnets inside and rebuild the train tracks. The trees along the track add beauty and color to the scenery, and lots of signs help keep traffic under control. Besides, a few citizens also live in this tiny metropolis, that adds unmatched realism and lifelike detail. A double-sided table top has a landscape design on one side and a plain reverse side. The railway track can run through a beautiful landscape along the river or motorway. If you don’t need a landscape design, simply turn the table on the plain side. Parents can use this set to help their kids learn colors, teach social skills, and foster creativity and imagination through creative play, that are important aspects of child development. The table size is appropriate for kids of 3 years of age and over. It’s large enough for multiple children to have hours of intriguing play at once. Parents will be happy to find out that this 120-piece train set takes about half an hour to assemble! Each sticker is coded with the number, corresponding to a picture in the manual. The set is supplied with construction pieces and pre-drilled with holes for bolts and nails. Some toy pieces require assembly, so the set comes with a Phillips screwdriver. Specially-designed T-molded edges prevent the table from chipping and a 1" lip keeps play pieces from falling off during play. 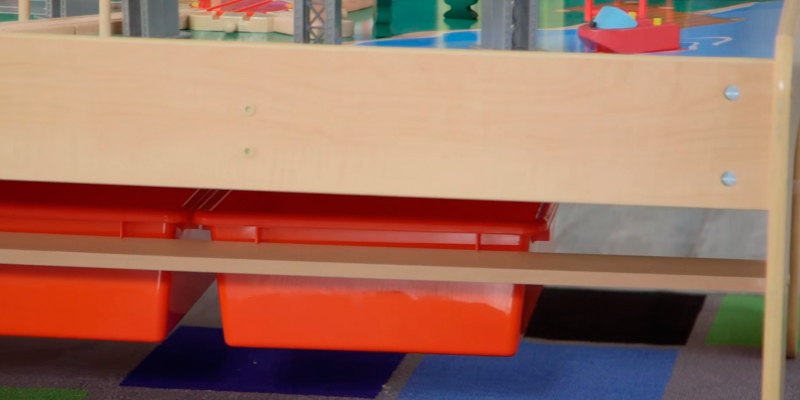 Also, durable plastic bins under the table are designed for convenient storage of all pieces. The bins with dimensions of 15.25 x 11.25” can hold all elements of your KidKraft Waterfall Mountain Train Set as well as additional track pieces for expansion. Wooden blocks of different shapes and sizes will help create different buildings, castles, and hills, that is particularly helpful in the development of spatial skills. Besides, your child can experiment with adding other elements to create a unique townscape. Most parents would agree that keeping home in order isn't easily done when little kids mess around and when there's not much space for storing their toys. Still, this isn't a reason not to consider buying a train set. 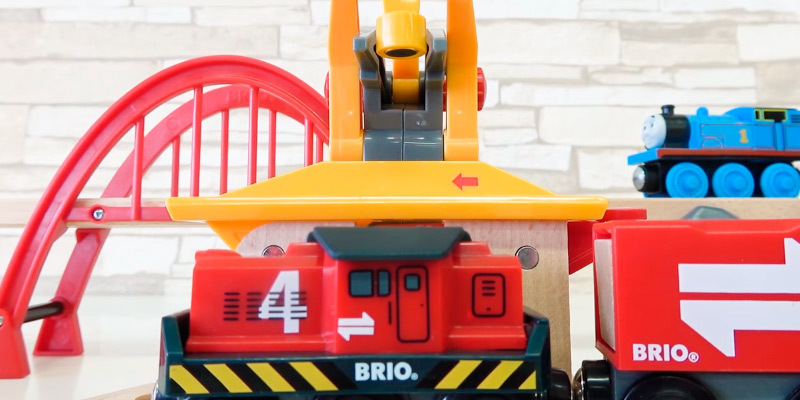 The Brio Cargo Railway deluxe set won't take much space but will help teach your kid to keep things organized. The set contains several biggish pieces that can be arranged in many different formations. Here, besides a train itself, you'll also find some nice trucks and buses with flashing headlights, a bridge, a police car, etc. Comparing to other train sets, this set is rather basic, but it may be the only option for a lot of people who don't want to buy a huge thing yet would like to indulge their kids' desires a bit. The set comes with a sturdy plastic box where you'd find it easy to hide away all pieces, carriages, rails after play. Or you can teach your child to do so, playing together and learning to right a room. The headlight lights up the way for the battery powered freight engine that will surely attract your child’s attention. All you need is to install 1 AA battery (not included). 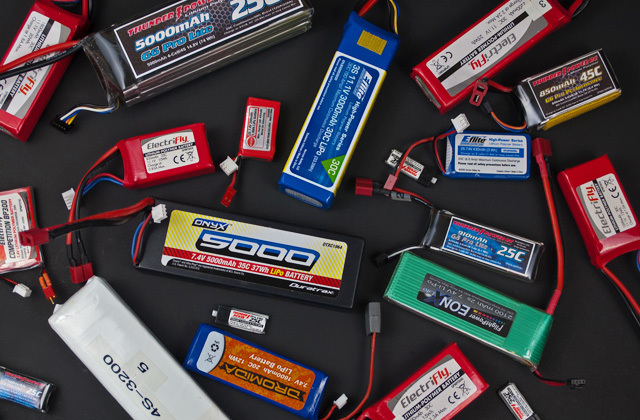 The battery is strong enough to go uphill and push train cars attached to each other with magnets. 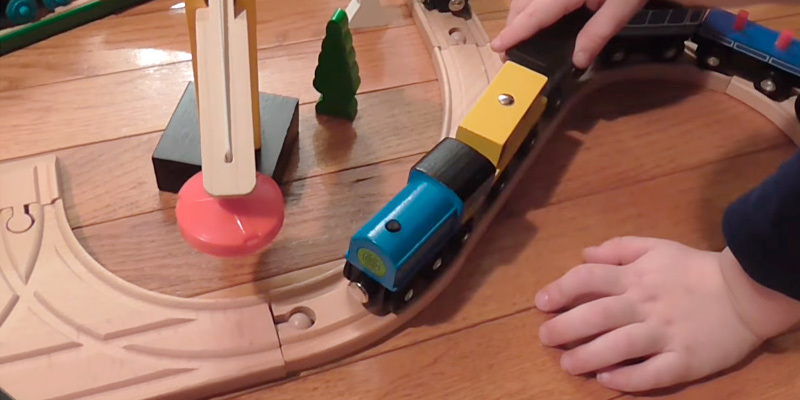 The switch tracks change the direction of the rails when pushing a button. Undoubtedly, this set will keep your children busy for hours. What’s Hidden Inside the Box? The set contains 30 track pieces with straight, curved, and elevated elements that allow you to build a layout with brick and arch-shaped bridges. Children are tactile learners. They need to physically touch and see what they are playing with to understand it. 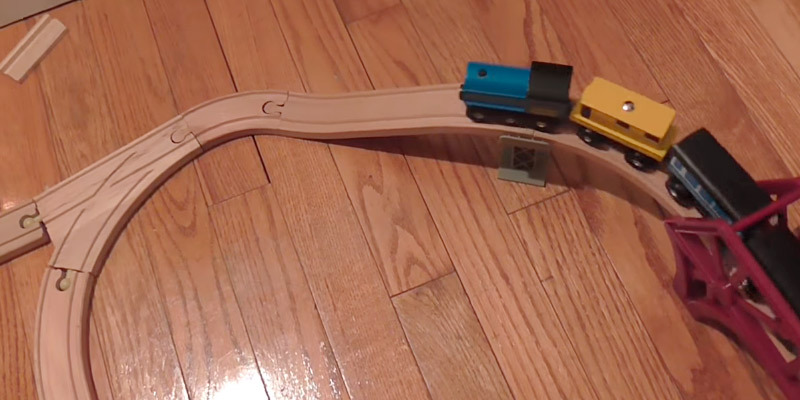 With this excellent train set, you can show how a battery-operated train slows down going up the hill and then speeds up plunging down the other side. Also, it will be interesting for your child to load and unload the trains with 3 mechanical, magnetic cranes, specially designed to hold the cargo securely during transportation. Thus, this train set will not only provide your little one with hours of imaginative play but also help obtain new knowledge and skills. 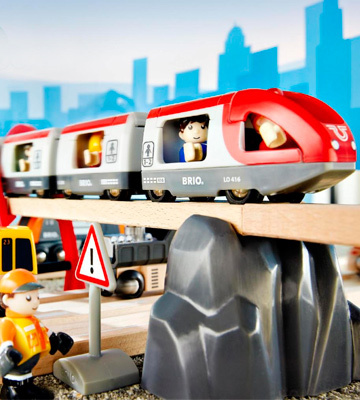 The Brio Cargo Railway Deluxe Set offers lots of developmental benefits to your child. And colorful marble runs will be a great addition to the set. This is a great way to develop logical thinking and visual perception, as well as keep your kid busy and occupied for a long time. 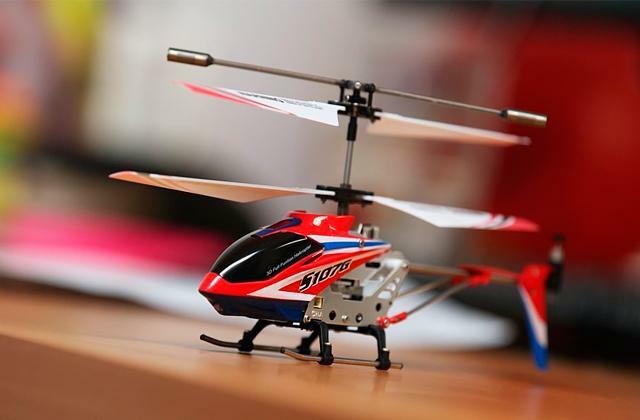 When choosing toys for children, parents often ponder about for how long they will be playing with these toys. Meanwhile, children don’t always share their parents' excitement about the same toys. When it comes to the Melissa & Doug Deluxe wooden railway set, however, you both will love it at the first sight! The set includes dozens of track pieces that set it apart from many other models of train sets. 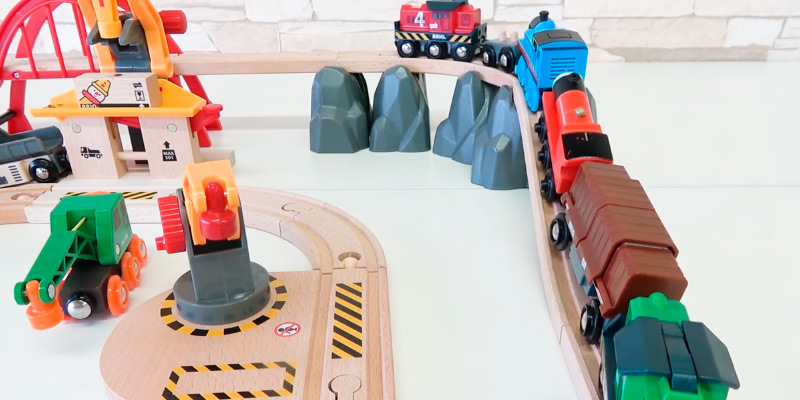 Using an easy-to-follow instruction, your child will be able to build 4 various track formations with straights and curves, climbs and descends, creating new layouts each time. 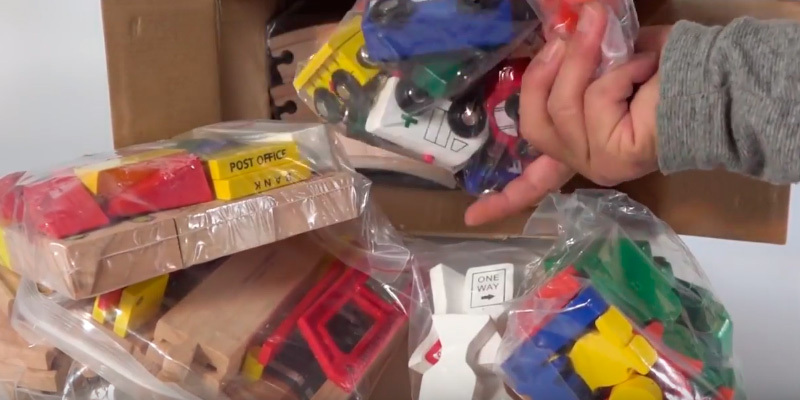 Besides main parts, there are 30 other accessories - trees, workers, trains, trucks, a magnetic crane, etc., so that your child could transport imaginary passengers, ship cargo and load off carriages. You can find a similar farm animal wooden train set with colorful cows and horses on it. The Melissa & Doug Deluxe wooden railway set is one of the toys that can unleash your child's potential and contribute to his/her creativity. 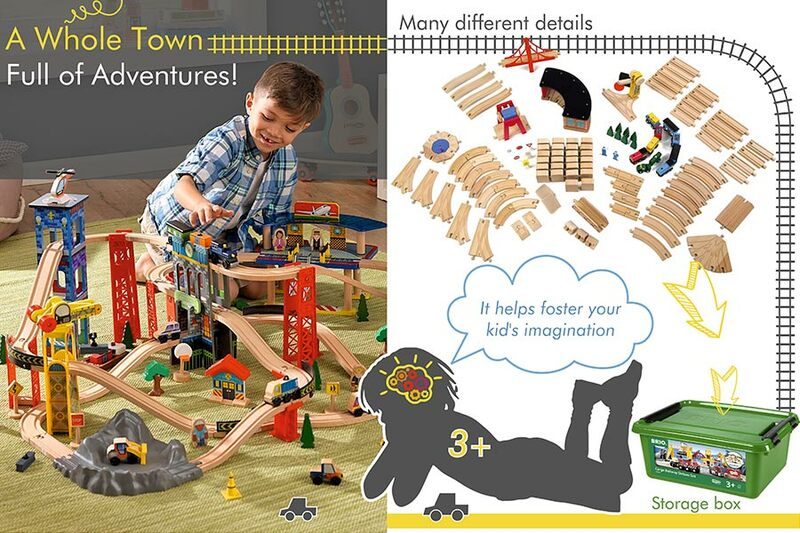 This fabulous set consists of a huge number of train track pieces - all your kid needs for railway fun! However, it takes up a lot of space. When assembled, the set measures up to 48"x 32". Just keep it in mind when planning to set up the set in your child’s playroom on a permanent basis. Yet, it is able to accommodate a number of kids at once. So, you can invite your child’s friends for an exciting play. The Melissa & Doug Railway Set offers lots of different train track combinations to keep multiple children busy at the same time! In addition to fostering creativity and imagination in children, Melissa & Doug focuses on manufacturing toys with safety in mind. 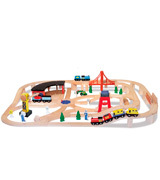 The Melissa & Doug Railway Set is made of quality solid wood and painted in vibrant colors from nontoxic materials. So, this train set is built to last and will delight your little one for many years to come. 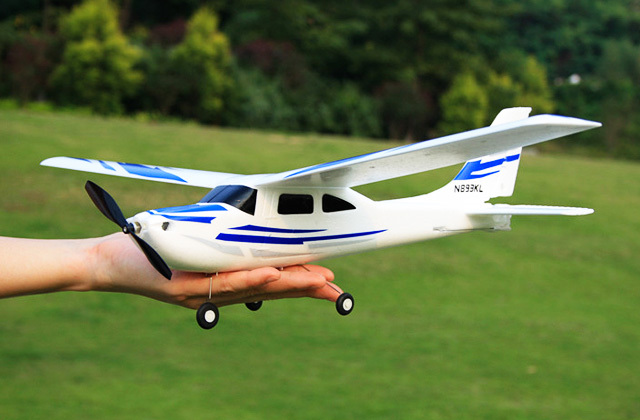 The product conforms to toy safety standards (ASTM-963 and CPSC Directives). Are you thinking about how to keep a large group of kids occupied and entertained for several hours? 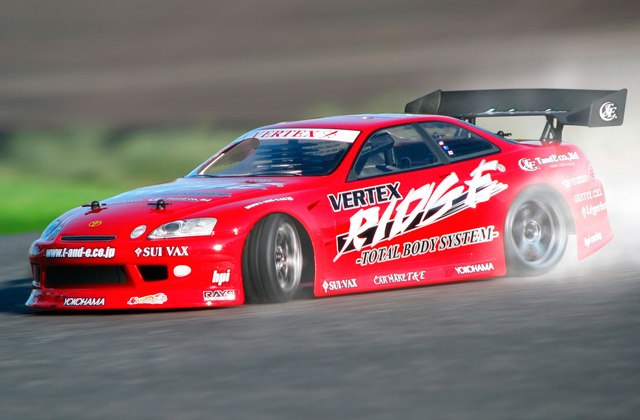 Consider buying the slot cars to provide hours of thrilling racing fun! 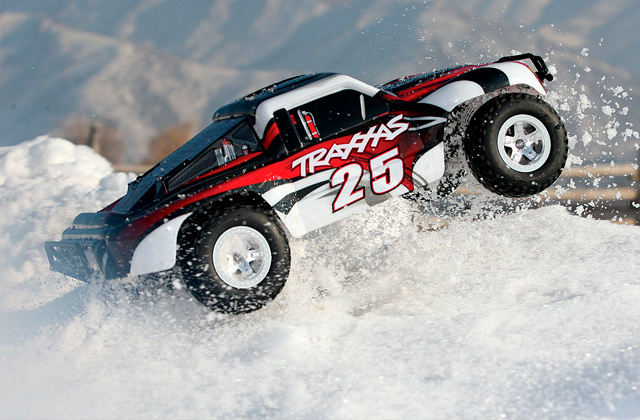 Trigger your kids' competitive spirit by holding slot car championships! 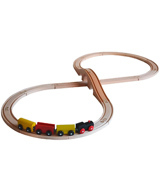 Actually, the Orbrium Toys Triple-Loop wooden train set is quite similar to other sets on our shortlist as they are compatible with other railway systems. The manufacturer offers a high-quality set with versatile track pieces. The bright-colored set allows your child to imitate various real-life situations, develop imagination, fine motor skills, and visual perception. The materials used in manufacturing the set are completely safe and conform to certification requirements. Add the Orbrium Toys Unpainted Wooden Train Cars to your child’s train set collection (sold separately), coloring them with painting markers or buy the Orbrium Toys 8 Unpainted Train Cars for Wooden Railway with colors paint and brushes, so your little one can create his/her own fancy toys, learn and recognize colors, and have a lot of fun in general! 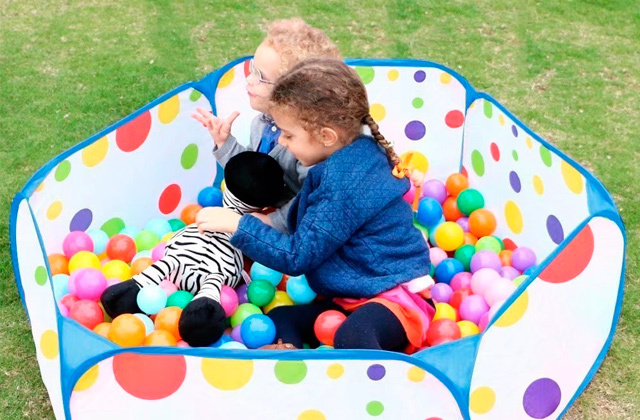 What could be more enjoyable than learning and playing together with your little one! Adding some extra pieces will allow for more layout configurations with plenty of opportunities for creative play. 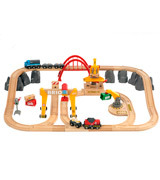 However, everything your child needs to recreate an exciting wooden train world is included in the basic set. So, it will keep your little engineer busy for hours! 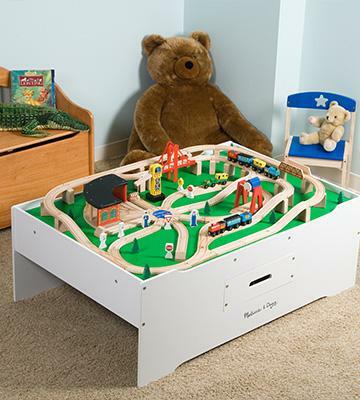 This affordable train set includes 100 easy-fitting wooden track pieces. 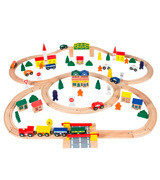 It comes with a triple-loop track layout that allows a smooth transition of cute colorful trains. Also, the set comes complete with figurines, buildings, cars, buses, trees and road signs. Different types of city vehicles, traffic signs, and a railway crossing allow you to explain some road safety rules to your child. Thus, your kid will be captivated for hours, while creating a world of fascinating train scenarios. The Orbrium Toys Train Set is designed for kids from 3 years of age and older, as it contains small pieces, which can be accidentally swallowed. However, what is dangerous for young kids can be useful for older children since small objects develop fine motor skills. This has a positive impact on cognitive abilities, enhances memory, develops speech and agility. The basic set is what you need to help your kid start recognizing colors without adding unpainted train cars. Most pieces are covered with bright non-toxic paint, besides some track sections. According to many experts, explaining difficult topics to children is easier through play. Moreover, the knowledge and skills obtained during the game are more likely to be applied to the real-world situations. 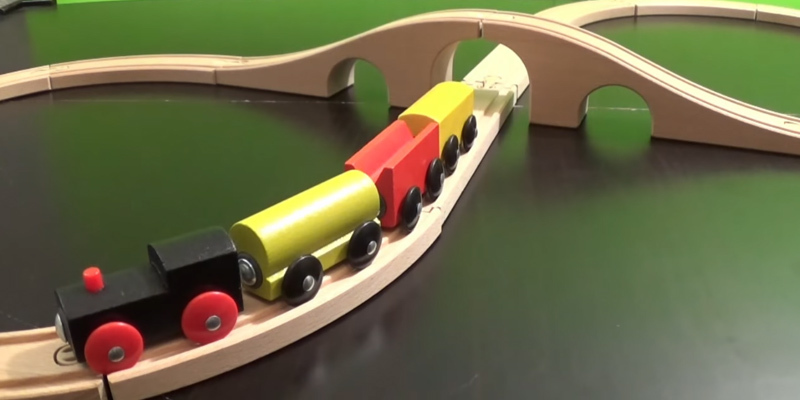 So, this wooden train set is a good investment into your child’s development. Does your child enjoy drawing? Then one of the beginner drawing sets is everything you need for teaching your little one how to draw step by step. If your kid doesn’t lose interest in drawing over time, you may buy a professional drawing set. Actually, wooden train sets are very popular among children and adults. Doubt that your child will love playing with it? Give it a try and buy a small, basic set from Ikea to see what your little one thinks about building tracks and running trains. Despite being rather small in size, the set is still complete and contains all main parts required for play. Like more expensive rivals, this railway station is compatible with many other railways systems from different brands, which means you can start with little and then expand the functionality of the toy with more pieces and rails, making it a much more exciting set to play with. 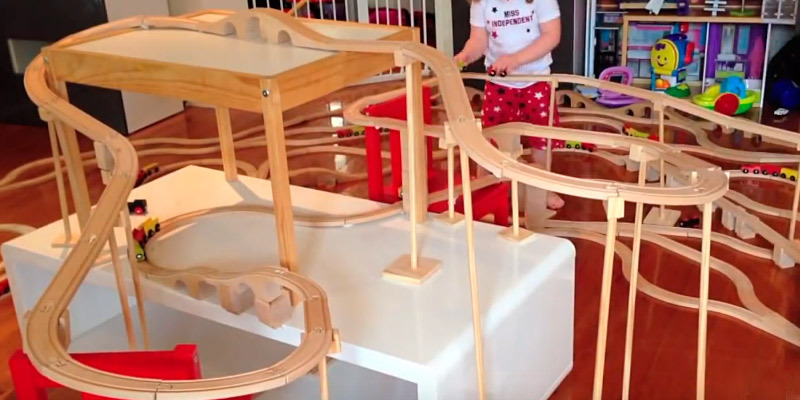 The Basic Ikea Train Set includes 16 pieces of the track with a total length of 9' 10" and a 3-car train. 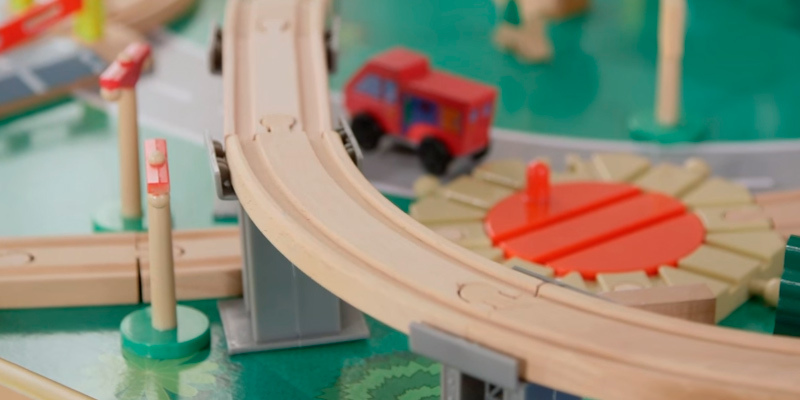 If you would like to add more pieces to your existing train set, the Ikea Basic Train Set offers lots of additional pieces of its own production. 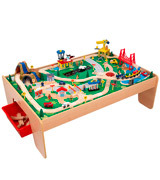 Furthermore, the Ikea railway is compatible with Fisher-Price Thomas Wooden, Melissa & Doug, Brio Railway systems - the most well-known train set brand names. So, you can expand your set with additional track sections to make your railroad adventures more exciting! Though, if you would like to add trains, cars, and other vehicles, you should bear in mind that larger trains may not pass under the arch. The track configurations of the Ikea Basic Train Set differ a bit from the other brands. Anyway, it doesn’t influence compatibility. It has female connection ends. 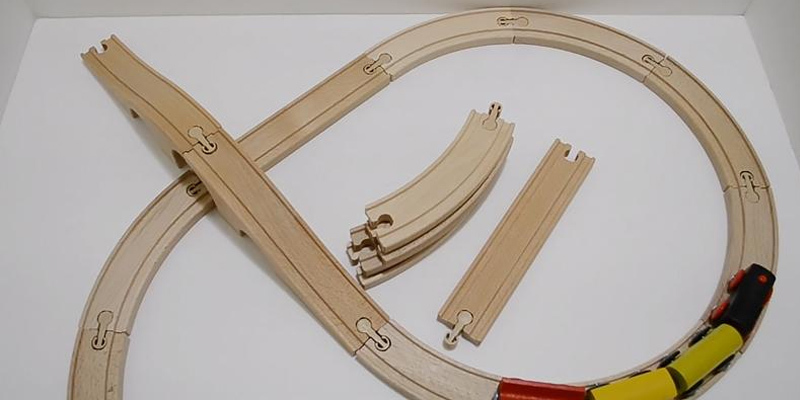 The track pieces are connected together like a puzzle to form a figure 8 train track, that allows for more options for new layouts. However, keep in mind that this train set is suggested for kids of 3 age and up due to small parts. Along with railway tracks, there is an abundance of car toys on the market. 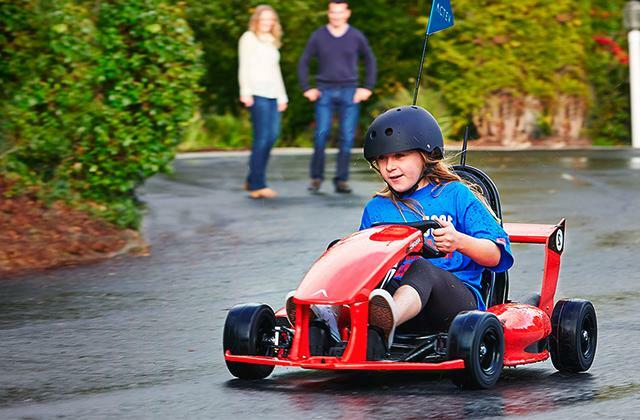 Add different models of car toys to your child's collection! If your kid is interested in collecting things, consider buying the car model kits. There are certain toys that kids can't do without and one of them is a train set, a popular and surely a must-have toy in any nursery. The market offers a great number of sets with wooden trains which differ by material, size, and a number of pieces included. You can find simple sets for smaller kids with bigger pieces and some real masterpieces for teens and adults. Commonly, wooden train sets are known to be more eco-friendly and suitable for kids use, they aren't easy to break and they can easily last for several years of play. Train sets have a positive effect on child's development and can help kids improve coordination, imagination and social skills through playing together with other children. Don't hesitate any longer and pick one of the best train sets from our review. 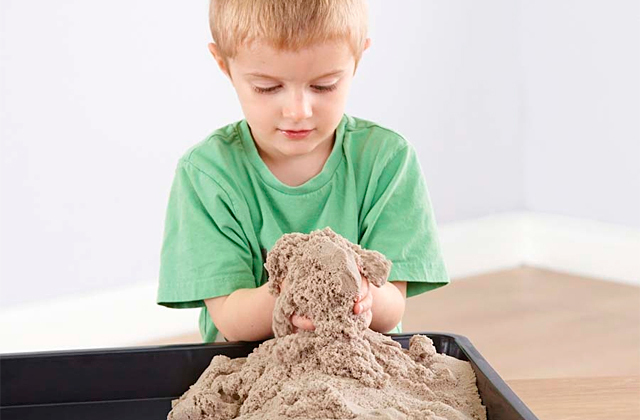 You can also consider play dishes and dollhouses that your child will surely love playing with. Today, most toys include a suggested age range. On that, a wooden train set is not an exception. Normally, the age levels for toys are determined by safety factors. In addition to being safe, toys for kids should match their stages of development and appeal to their interests. So, toys are ranked by popularity for a particular age group. In terms of safety, some toys have small parts that can be swallowed, thus they are not intended for children under 3 years old. At this age, children stop taste-testing small pieces unlike younger kids who need to have a direct experience with the world. 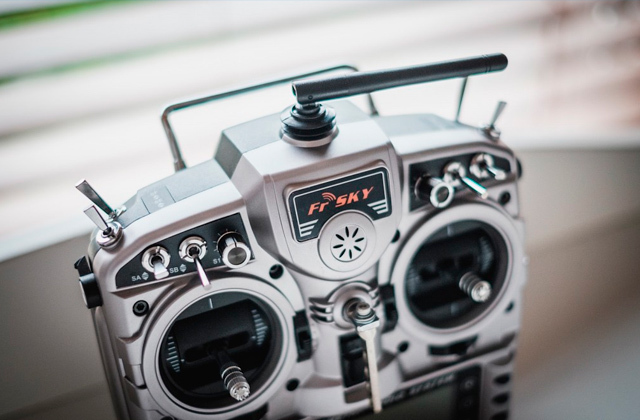 Thus, if you have decided to buy a toy, recommended for 3-year-olds and older, keep small items away from your child to avoid ingestion hazards. Play possibilities and the diversity of track pieces are also important for building unique routes and creating your own busy cityscape. 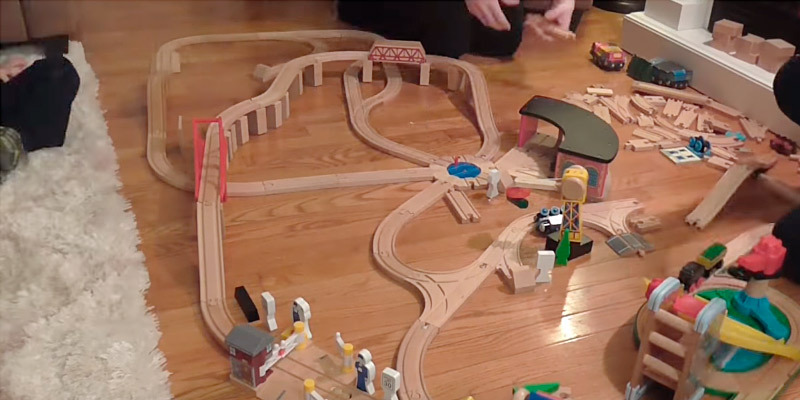 A wooden train set with lots of pieces like straight and curved train tracks, bridges, and level crossings allows for complex layouts by changing the track configuration with trains, freight cars, and other vehicles running on a railroad track. It's great when the set has plenty of extra pieces, such as buildings, human and animal figures to create different environments and stimulate your child’s imagination. 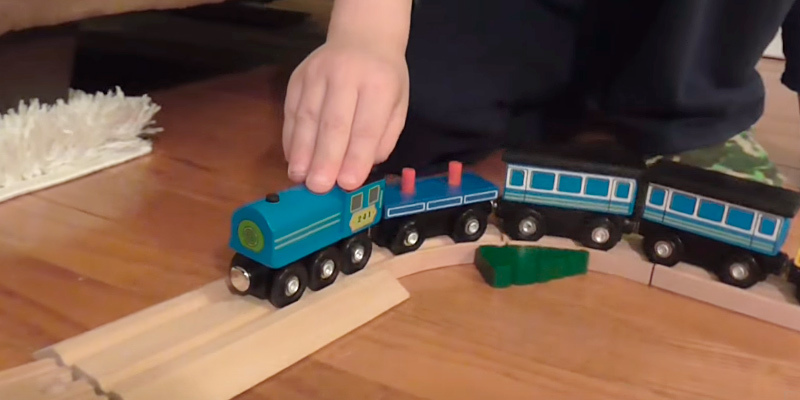 If you are not sure that your little one will be interested in this train themed activity, you can buy a starter set and then add extra track pieces. Surely, a train set that takes up half your room or even the entire room will fascinate children and adults alike. However, not everybody is fortunate enough to have space for a separate playroom to keep all toys organized. But there is no problem at all with a plethora of wooden train sets of different sizes on the market. Before buying a set, take a closer look at the additional features it provides. It may come in a box that could be saved as storage for the set. Also, it can be a battery-powered locomotive with moving parts, flashing headlights, smoking action, and realistic sounds. 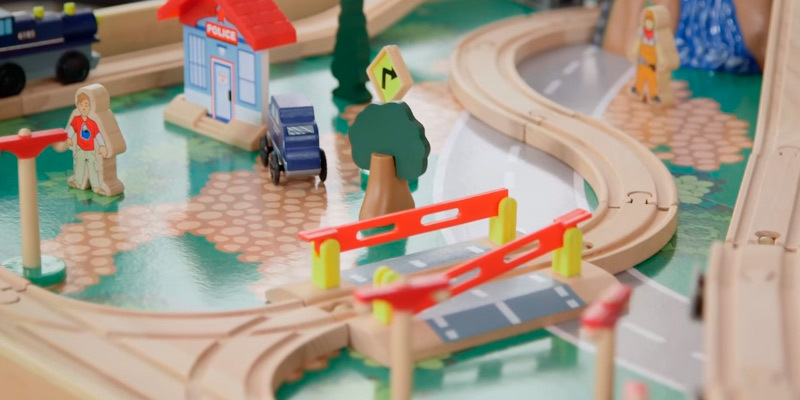 If you are planning to add more pieces to your existing set for a large expansion, you need to check if it’s compatible with popular wooden railway systems. After taking into account all the above-mentioned features, it will be easier to make an informed choice. A: Safety is one of the key parents' considerations when choosing toys for kids. The good thing is, all wooden train sets from our shortlist have been thoroughly tested by manufacturers and they all comply with legal safety requirements, so you can be sure, none of the sets from our picks can make any harm to your kid. A: Most children like layouts with tunnels to see the trains disappear and reappear. Also, they love animations, such as flashing crossing signals, operating crossing gates, and oil pumping accessories with bubbling tubes. Kids are interested in operating freight cars - animated box cars and log dumpers. Besides, they like to hear the whistle and see the smoke of steam locomotives. A: The larger scales are recommended for younger railroaders. Electric train set requires adult supervision. G-scale or O-scale train sets are easier to manage. Also, they are big and colorful. The larger scales are also good for adult beginners. A: Most modern sets have snap together track and color-coded wiring that easily plugs in.